Does My Org Qualify for Lightning Experience? What About Apex and Visualforce? Describe some of the major feature differences between Lightning Experience and Salesforce Classic. Describe some of the features that aren’t available in Lightning Experience, and know where to get more details. 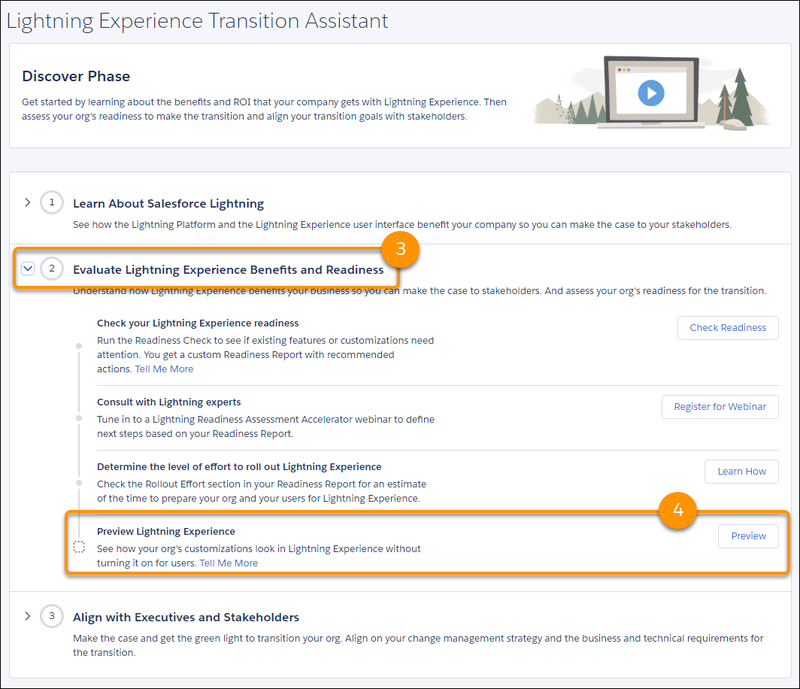 Use best practices and the Lightning Experience Transition Assistant to evaluate your org’s readiness for Lightning Experience. Let’s look at the supported editions and user licenses to see if you can enable and use Lightning Experience. To learn about browser options and limitations for Lightning Experience, see Supported Browsers for Lightning Experience in the Salesforce Help. If your org still uses Internet Explorer 11, be aware that we’re in the process of retiring support for this browser. There are significant performance issues when running Lightning Experience in IE11. Even if you opt into the extended support option for IE11, we recommend migrating your users to an alternate modern browser like Google Chrome or Microsoft Edge as soon as possible. Lightning Experience is a modern user interface that helps your sales reps sell faster and your service reps support customers more productively. Lightning Experience includes many new features and entirely redesigned pages, but not every Salesforce feature is supported in Lightning Experience. So the Salesforce experience you’ve known to date—called Salesforce Classic—is still available for you, and the users you enable for Lightning Experience can switch between the two at will. As your company’s trusted advisor for Salesforce, you need to help your company decide when to enable Lightning Experience. So, we’ve got to start getting you educated on Lightning Experience features versus Salesforce Classic. Understanding what you get in the new interface can help with your decision to switch to Lightning Experience. We listed some highlights of how Lightning Experience compares with what you’re used to in Salesforce Classic. Highlights include features that are available in the new interface only. This isn’t a comprehensive list of supported and unsupported features. For a more detailed list, see the Salesforce Help. An intelligent page filled with insights, a slick performance chart, and a helpful assistant feature, highlighting what’s most important each day. 1 In Lightning Experience, Home show events remaining on a user's calendar today. Users can access all their events from the Calendar tab in the navigation bar. Sales and service reps get a layout designed to help them find the information they need, fast. Sales reps in Lightning Experience find a turbo-charged workspace for managing opportunities and leads. View related information in the Quick View. Create tasks and events, log calls, and send emails, and track all those activities in the Activity Timeline. Sales reps can use the Kanban view, a visualization tool, to review deals organized by each stage in the pipeline. With drag-and-drop functionality, sales reps can move deals from one stage to another, and get personalized alerts on key deals in flight. Kanban is available on opportunities, leads, tasks, and many other objects. 1 Only list views marked as “Visible only to me” or “Visible to all users” are supported. Sharing with certain groups of users isn’t supported. To filter on other fields, use a web tab. See Get More Accounts Using Data.com in Lightning Experience. Accessed via the Data.com tab or Search Global Ultimate DUNS button on D&B Company records. Data.com Prospector: Search for contacts and import them as contacts Users can search for a contact when it’s related to an existing account. On the account detail page, click the Get More Contacts button, and use the search box and filters. To search for other contacts, use a web tab. See Prospect for Key Contacts in Your Accounts Using Lightning Experience. Accessed via the Data.com tab or Get Contacts button on accounts. See Prospect for Key Contacts in Your Accounts Using Salesforce Classic. Data.com Prospector: Search for contacts and import them as leads Web tab required. Accessed via the Data.com tab. Data.com Prospector: Export companies or contacts to a .csv file Web tab required. Accessed via the Data.com tab. Data.com Prospector: See key company insights on accounts Accessed via the Get More Insights button on accounts. See Prospecting Insights in Lightning Experience. Accessed via the Prospecting Insights button on accounts. Data.com Prospector: See key company insights on opportunities Accessed via the Get More Insights button on opportunities. Data.com Prospector: Prospect for accounts within the same corporate hierarchy On accounts and opportunities, accessed via the Get More Insights button (Data.com Insights component) or via the Company Hierarchy component. Accessed via the Company Hierarchy button on accounts. Data.com Clean: Administrative settings Not available. Use Salesforce Classic to administer Clean jobs and configure Clean settings. Administer Clean jobs, and configure Clean settings. Data.com Clean: Clean accounts with company data Bulk cleaning: Clean jobs for accounts. Manual cleaning: Available using the Company Info for Accounts data integration rule (Premium Clean required). See Update Accounts and Leads with Key Company Information. Bulk cleaning: Clean jobs for accounts. Manual cleaning: Clean button on accounts. Data.com Clean: Clean contacts with contact data Bulk cleaning: Clean jobs for contacts. Manual cleaning: Available using Data.com Contact Clean, a free component from Salesforce Labs on AppExchange. Bulk cleaning: Clean jobs for contacts. Manual cleaning: Clean button on contacts. Data.com Clean: Clean leads with contact data Bulk cleaning: Clean jobs for leads. Bulk cleaning: Clean jobs for leads. Manual cleaning: Clean button on leads. Data.com Clean: Clean leads with company data Available using the Company Info for Leads data integration rule (Premium Clean required). Data.com Clean: View and refresh D&B company records Accessible via a link on an account or lead. A Salesforce Classic tab opens. The tab doesn’t interrupt the user’s Lightning Experience session. Accessible via a link on accounts or leads and from the D&B Companies tab. 1 The Service Console in Lightning Experience doesn’t yet have full parity with the Service Console in Salesforce Classic. Learn more. 2 There are some limitations using Entitlements in Lightning Experience. Learn more. 3 Enabling Lightning Knowledge changes your org’s data model to use record types rather than article types. To move from Salesforce Classic Knowledge to Lightning Knowledge, use the Lightning Knowledge Migration Tool (Beta). Test your data migration in a sandbox or trial org before enabling Lightning Knowledge in your production org. After you enable Lightning Knowledge, you can’t disable it. Lightning Knowledge doesn’t yet have full parity with Knowledge in Salesforce Classic. Learn more. 4 Snap-ins setup is available in Lightning Experience only. However, the snap-in itself can go anywhere on your website. Sales and service reps who use reports find an improved user interface, including the ability to easily create filters and add enhanced charts. And Salesforce admins find features on the dashboard editor, including flexible layouts and spanning columns. However, some report features aren’t yet available in Lightning Experience, including feeds and scheduled reports. 1 Folder sharing setup isn’t available in Lightning Experience. But folders created in Salesforce Classic inherit all assigned permissions when the folders are viewed in Lightning Experience. 2Available in Lightning Experience by subscribing to a report. 3You can configure conditional formatting in Lightning Experience using the Salesforce Classic report builder, but not using the Lightning Experience report builder. Though configurable, conditional formatting doesn’t display on reports in Lightning Experience. 1 Users can’t schedule dashboards in Lightning Experience, but dashboards scheduled in Salesforce Classic run as expected in Lightning Experience. Instead of scheduling dashboards in Lightning Experience, subscribe to them. List Views have gotten an upgrade in Lightning Experience, including some super new stuff like the ability to create a quick chart from a list view or add filters with an improved, easy-to-use interface. 1 In Lightning Experience, sharing list views marked as “Visible only to me” or “Visible to all users” is supported. Sharing with certain groups of users isn’t supported. 2 To create or disable community users, log in as a community user, and use delegated administration, switch to Salesforce Classic. There are some other features that aren’t available or don’t work in Lightning Experience. We want to be transparent with you about them, so you know about customizations you may need to update before enabling Lightning Experience. Many apps from the AppExchange feature customizations, including custom objects, custom buttons, Visualforce pages, and more. Salesforce partners are testing their apps in Lightning Experience and applying for Lightning Ready certification. Apps that are Lightning Ready work in Lightning Experience and offer a more consistent experience with other Lightning Pages. If an app is supported in Lightning Experience, a Lightning Ready sash appears on its AppExchange listing. If an app isn’t supported in Lightning Experience, use it in Salesforce Classic instead. Your org can use apps without Lightning Ready certification in Lightning Experience, but some features might not be available or work as expected. These apps can also appear visually inconsistent with Lightning Experience because they use Salesforce Classic styling. For the best experience, use Salesforce Classic for apps that aren’t certified as Lightning Ready. When we talk about customizing Salesforce “programmatically,” we’re talking about using code to add new features. Most of the time, like when you’re using the API or writing Apex triggers, there isn’t an actual user interface to the feature. Guess what? All of that stuff just works whether you’re in Salesforce Classic or Lightning Experience. Woohoo! Other features do have a user interface. In that case, we’re mostly talking about Visualforce. Your existing Visualforce pages work in Lightning Experience, most without needing any adjustments. But there are a few Salesforce Classic features and attributes that may not be compatible in Lightning Experience. And if you plan to have users working in both Salesforce interfaces for awhile, you can apply Lightning Experience stylesheets so the same page gets classic styling in Salesforce Classic and Lightning styling in Lightning Experience. Use the Lightning Experience Configuration Converter to evaluate the status of your org’s Visualforce pages, get workarounds for pages with issues, and automatically apply the Lightning Experience stylesheets to desired pages. 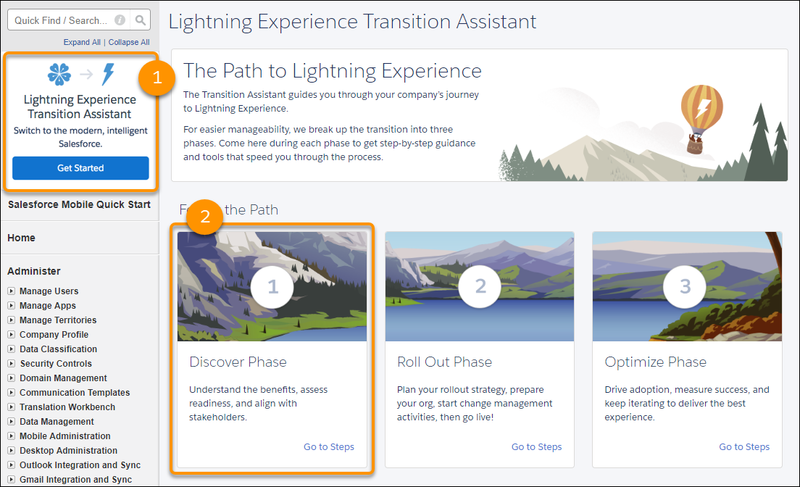 If there are complicated issues with some of your org’s Visualforce, or you’d like to explore replacing Visualforce with Lightning components, we created a Trailhead module for Visualforce developers and an entire trail for developing Lightning Experience apps. We recommend checking out these resources as part of your Lightning Experience evaluation process. To evaluate whether some of the key features and customizations you’ve implemented in Salesforce Classic are ready for Lightning Experience, kick off the Lightning Experience Readiness Check. That way, you can learn which are ready now for Lightning Experience and which may need your attention before you switch over all your users. You’ll get a personalized Readiness Report, with an assessment of the features and customizations evaluated by the Readiness Check and recommendations on your next steps. Plus you’ll be eligible for a free group session with a Lightning expert to learn more about using your report to create a rollout plan. The Readiness Check emails the report to you and also saves it to Salesforce Files. Curious what exactly is covered in the report? Check out What Does the Lightning Experience Readiness Check Evaluate? in the Salesforce Help. Run the Readiness Check from the Lightning Experience Transition Assistant in Setup. From Setup in Salesforce Classic, click Get Started in the Lightning Experience Transition Assistant tile at the top of the menu (1). Select the Discover phase (2). Click Evaluate Lightning Experience Benefits and Readiness to expand the stage (3). Click Check Readiness next to Check your Lightning Experience readiness (4). We’ve also put together an enablement pack with sample documents and templates, including a gap analysis checklist. You can use this checklist to expand your evaluation to features and customizations that aren’t covered by the Readiness Check. It’s all well and good to talk about use cases and supported and unsupported features. But wouldn’t it be great if you could see your Salesforce org in Lightning Experience without having to actually enable the new interface? Even if you don’t have a sandbox org? 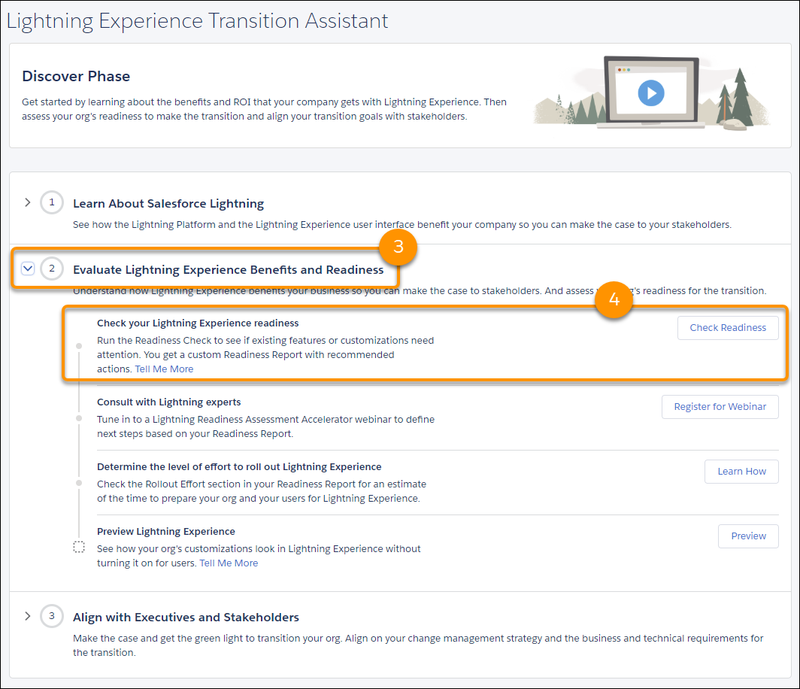 Well, the great news is you can, using the Lightning Experience Transition Assistant. The Transition Assistant’s Preview feature lets you explore your production org in Lightning Experience, so you can see exactly how your real data and your current customizations work in the new interface. And helpful hint, the Preview is a great way to review the state of features and customizations that aren’t evaluated by the Lightning Experience Readiness Check. The Preview feature isn’t a locked-down, read-only tour. You can change data, settings, permissions—you name it. But remember that you’re working with your live org. If you do make changes, they’re for real and visible to your users back in Salesforce Classic. Click Preview next to Preview Lightning Experience (4).